Enter to win an aluminum Rollator by Medline! Next month one lucky entrant will win a Deluxe Aluminum Rollator from Medline as part of our “Helping You Get On With Life” monthly sweepstakes. Read on to learn why the Rollator is an independent-living essential and how you can enter to win. 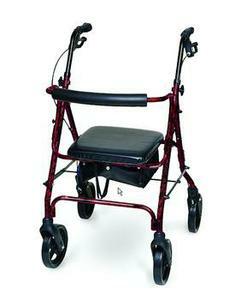 A Rollator is a must-have mobility tool for many seniors today, and our readers are eagerly anticipating this prize. In addition to the physical support they provide while walking, Rollators offer peace of mind to seniors and caregivers who are at risk of or who fear falling. Now available with seats, back rests and storage baskets, Rollators are perfect tools seniors who want to age in place — remain living safely and independently in their own homes for as long as possible. A lightweight yet durable frame that folds easily for transport and storage. Comfortable 13”x13” seat and easy-detach padded back rest. 8” polyurethane wheels that roll easily on any surface, including carpet. Extra storage under the seat for essentials. Supports up to 300 lbs. and ideal for users approximately 5’4” to 6’2” tall. The Deluxe Aluminum Rollator is valued at $129.99. To win, participants need only e-mail or mail a short statement explaining why the prize would be useful to him or her or a loved one. We will accept entries for this prize through Aug. 31 and will notify the drawing winner within the first week of September. We created the “Helping You Get On With Life” monthly sweepstakes to raise awareness of products and services that help seniors live independently and make caregivers’ jobs easier. To learn more about the two easy ways to enter and preview upcoming giveaways, visit our “Helping You Get On With Life” sweepstakes page. And be sure to download your free fall prevention guide, too. Watch this video on ways to make a senior's home safer.